mac iPhone manager, mac iPod manager, mac iPad manager, sync iPhone to mac, sync iPad to mac, sync iPod to mac, Mphotos, bookmarks, notes and more from iPhone, iPad and iPod to iTunes Library & Mac. Extract photos, contacts and more from iTunes backup to Mac. 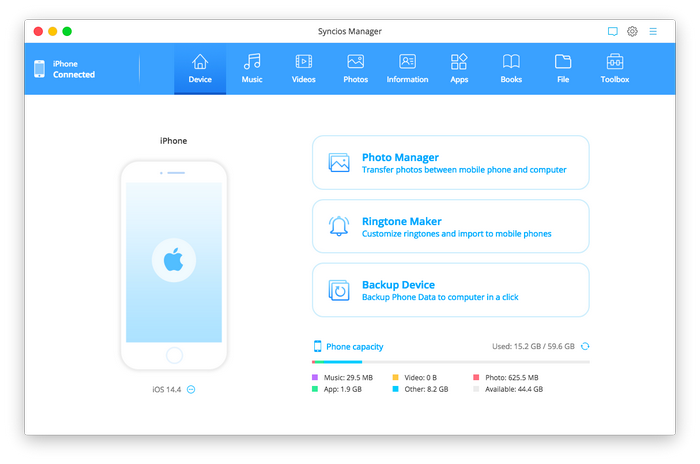 With Syncios for Mac, you can also easily extract contacts, photos, call history, notes and messages from iTunes bacup files to Mac. This would help you get files backup to Mac if your iDevices got lost or damaged. 1.Support several languages. 2.Support devices on iOS 9. 3.Support to edit Photo Library on iOS 8 and above version. 4.Fix some other bugs. Tipard Total Media Converter Platinum can easily help you rip DVD, video files to any other video files like MPEG-4, H.264/MPEG-4 AVC, MOV, M4V, AVI, WMV DivX, etc. and even 3D videos. It supports iPhone 6/6 Plus, iPad mini 3/2, iPad Air2, etc. Tipard MXF Converter can help you a lot in transcoding MXF or P2 MXF files to iPhone, iPad, HTC, Kindle Fire, etc. portable devices supported file formats. It also can help you convert MXF, TS, MTS, M2TS, etc. to popular video and audio formats.